Today the minimum wage will go up in 5 provinces across Canada (Alberta, Saskatchewan, Manitoba, Ontario and Newfoundland and Labrador). In Ontario, ACORN members are waking up to a .25 raise in the minimum wage today. This bittersweet increase comes from their efforts on the Minimum Wage Campaign, that included demanding indexing to inflation. ACORN members and allies won the indexing demand but the actual raise fell short of the needed $14/hour. For our members who earn minimum wage this raise equals about $10 more every week in pay - and when you are struggling with rises in rent, food, and transportation costs, that $10 is something to help you along the way. But it is not enough, which is why ACORN Canada has a national Wages Rising campaign. The campaign includes fights for Fair and Living Wages, and an increase in the minimum wage. The Wages Rising campaign's ultimate goal is to have a minimum wage equal a living wage. However, we are a long way from that. 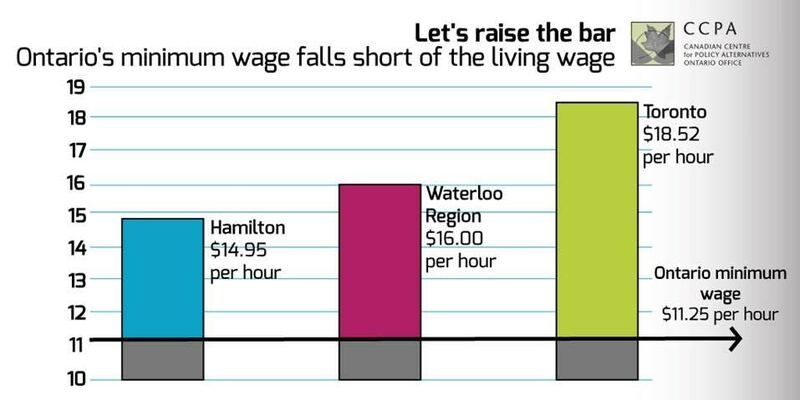 Experts calculate an actual living wage in various cities to be $18 to $21 an hour. Our experience as a multi issue organization shows that wage campaigns feed into one another, building momentum and support as we take steps down the road to social and economic justice. ACORN Canada, with community and labour allies like SEIU, are following the path blazed in the USA with a sector-based Fight for $15 on their hands for federal workers, with a focus on federal cleaners with the Invisible No More campaign. Further, in BC and Nova Scotia ACORN Members are actively fighting for a $15/hour provincial campaign. ACORN will not rest until every family gets a living wage. All movements raising wages in this country for the working poor, count on it that ACORN members will be involved. ACORN members will keep organizing, to build the political power needed to force change.